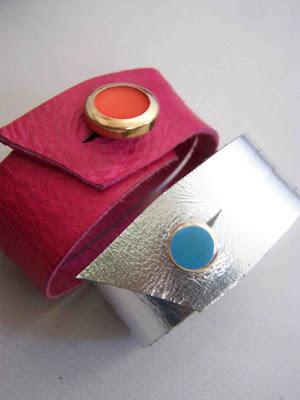 Yesterday I mentioned that I had a more feminine version of the leather cuff. Here it is, and I'm even going to give you a tutorial so that you can make one for yourself (or anyone on your Christmas list). The thing that I love about about working with leather is that you can cut right into it, and you don't have to worry about finishing off edges. I also love that it is soft and really quite comfortable when worn. I'd like to thank all of the Rodeo Queens out there who want pink and metallic silver chaps. Thanks to you I can now have these ultra feminine leather cuffs. This was scrap leather that I picked up on my most recent trip to the saddle store (where I buy all my leather for small projects). Due to the fact that I am buying scrap leather, you never know quite what you'll find. I really feel like I hit the jackpot last time. Read more below for the full photo tutorial. To make these bracelets you'll only need a few supplies. 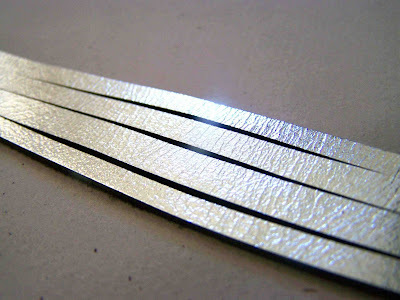 Cut 1 inch wide, and long enough to be worn on wrist comfortably, plus two inches for overlap. Pink Band: 1 1/8th Wide, 8 1/2" long on longest edge, and 8 inches long on shorter long edge. 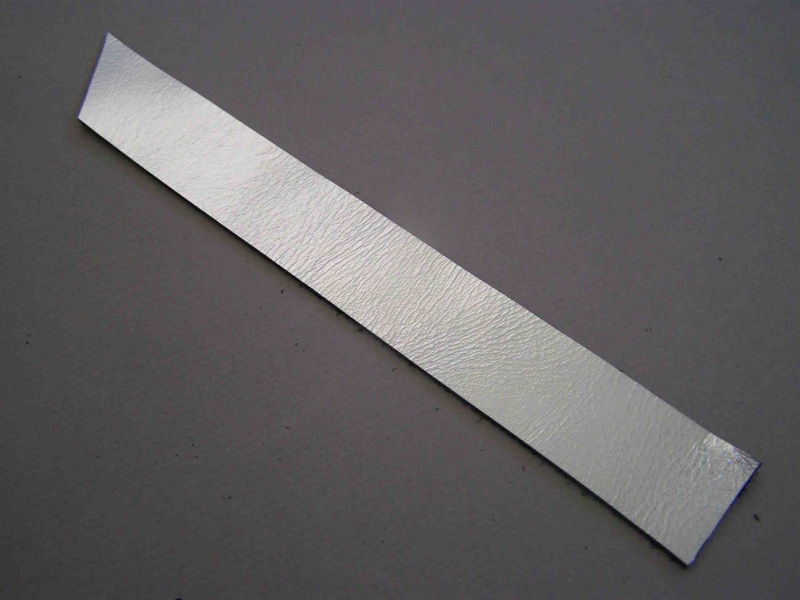 Silver Band: 1" Wide, 8 inches long on longest edge, and 7 1/2 inches on the shorter long edge. I prefer a straight edge and rotary cutter for this, but a sharp pair of scissors and a ruler will work fine. I prefer a button with a shank, but of course you could try any button that you'd like. A snap could also work if you prefer it. I like heavy duty or button thread. If you don't have any on hand I'd suggest doubling up your thread. A leather needle is helpful in this case. If you don't have one, a larger needle or awl will work as well. 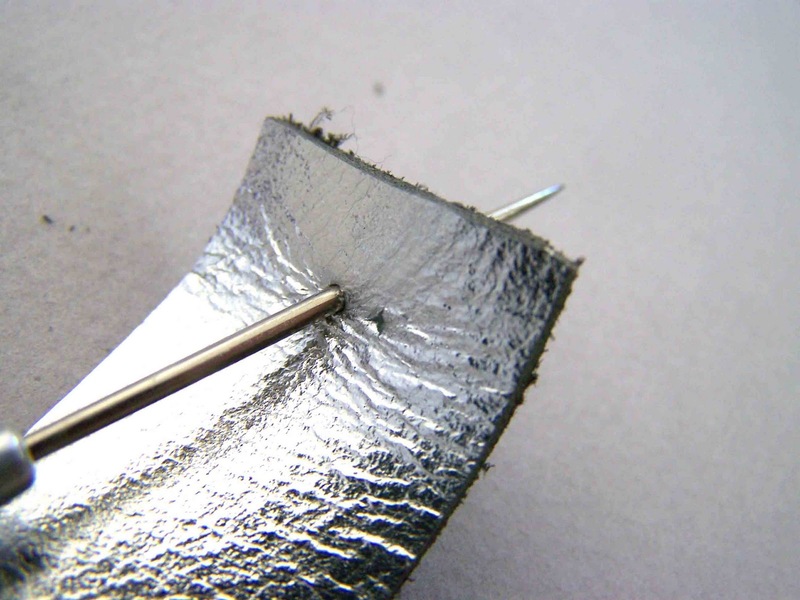 Note: Leather needles have a blade at the end of the needle that cuts the material. It makes it much easier to push through the thick leather. You can find them at most craft stores, and they can often be found in packs of assorted needles. 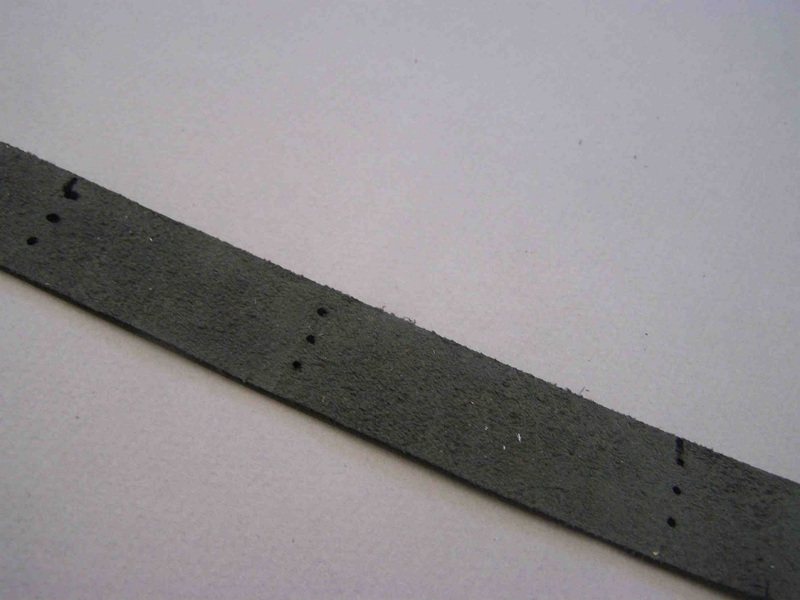 Once your strip of leather is cut to the desired length and width it is time to start marking and measuring. 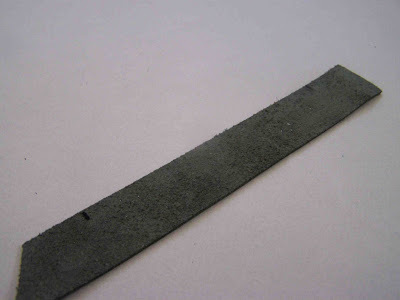 Turn your leather strip so that it is right side down. With a pen or pencil make a small mark 1 1/2 inches from either end of your strip. Now we are going to make some markings to indicate where our "coils" are going to be cut. I made three sets of three markings along the length of my leather strip. Each dot is 1/4" apart (from either edge of strip or nearest mark). We are now going to connect the dots. 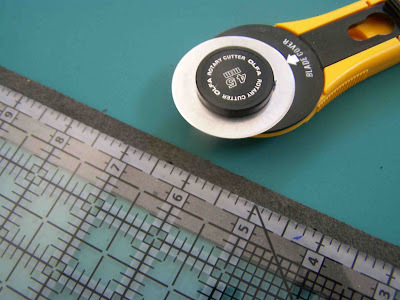 Use your straight edge and rotary cutter (or scissors) to cut your slits. You should end up making three slits. These slits should begin and end 1 1/2 inches from either end. It is now time to attach your fastener. If you are using a snap you will want to follow the manufacturers directions. If you are attaching a button I have provided a few helpful tips below. If you don't have a leather needle on hand you will want to pierce holes for your button. I used an awl and pierced my holes relatively close together. You could use a large needle for this step if needed. 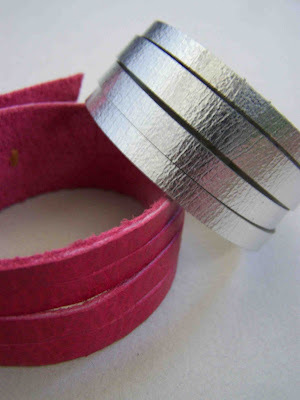 You will be attaching the button to the blunt end of your leather strip. The angled end will be home to the button hole. Sew your button securely in place. We are now going to create our button hole. Luckily we don't have to worry about dealing with a sewing machine for this step. Simply cut a small hole in the angled end of your leather that is slightly larger than your button. My button hole runs lengthwise, but I can't see any problem with cutting it widthwise if you have the extra room. Make sure that you have at least 3/8" between the end of your leather strip and the end of the button hole. That's it. 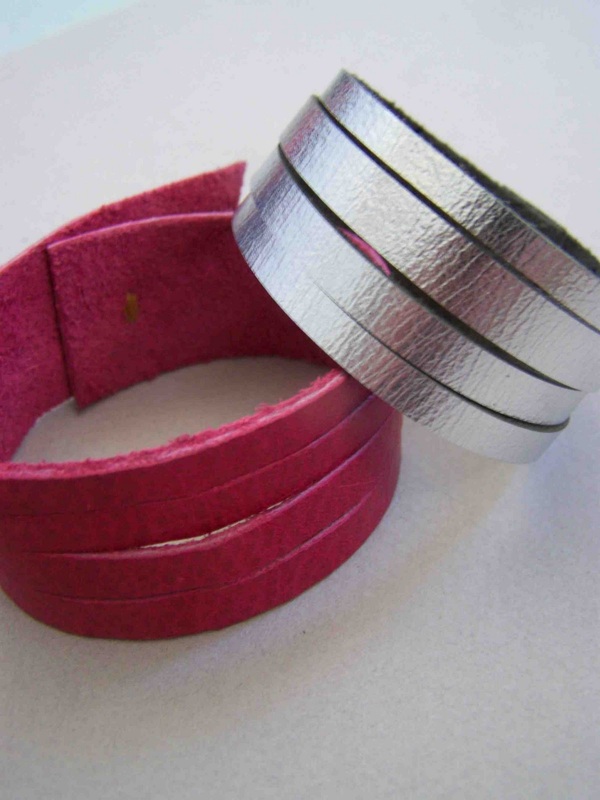 You've created a simple and fun leather coil cuff. It is so quick to make that you could easily whip several of these out in no time at all. Sorry about the lack of modeled pictures, but it's a bit difficult to photograph it while wearing it. I'll be linking up here. Love, love, love this idea. Thank you so much for this post. I see several of these in my future. These are awesome. I have to make one. Great idea for Christmas thats going to be here soon. Very cool idea! Love the pink & orange together. Awesome! And super easy! love it! Excellent tutorial. Simple yet bold! Thanks for sharing. I will link in a future blog post so others can come visit! Could be made as cup koozie too. Like Starbucks cup.